OK, I admit I am a little old fashioned!! It is not easy to change one's ways of doing things, especially when you believe you are not doing anything wrong. Today I will talk about ironing. I was lucky to be brought up in the era when electric irons were in use - in fact in all these years I don't see a lot of change in these appliances. I mean, they still plug in with a cord, (which is a real pain - have they invented wireless irons yet? ), heat to the setting you choose, and most have a smooth surface though I know there has been some developments in the surface, but not much. Yes, one can put water in a "tank" and use it to iron with steam or spray that piece of the fabric that needs a "kick". Fabrics have changed too. My grandmother and for her early life, my mother, had to deal with cotton and linen fabric which was always a bit cantankerous and took a lot of time. I remember my mother did not have an ironing board in the early days and spread an old blanket andthen a piece of sheeting on the table and worked there. How wonderful is it to have an ironing board, which one can set to a suitable height and doesn't need dismantling - just a quick flick of a piece of metal and it folds up and can be hidden away in a small out of the way place. My daughter, fast heading towards her 50's has a massive amount of ironing. She only has two children (two teenagers), who must change their clothes (usually throwing them on the floor for mother to collect or to scream at them to pick up their clothes and put them in the laundry! ), and a husband. I think they all change clothes every 2 or 3 hours, otherwise how do they get so much to be laundered and ironed?? My grandmother would have had an iron that required heating on the wood stove - so she would do her deed on the fabric with the heavy iron and in a short space of time would have to return it to the stove to reheat. But now we have a cordless iron. I found this one (see image below) of a Semco iron, which looks rather neat. 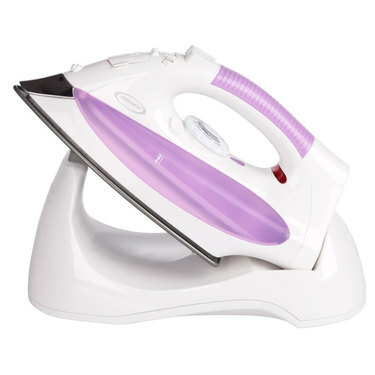 It is not expensive (around $A40) and when my current iron decides it has had enough time with me I will buy one!! Now, what I really started to comment on, are the people (yes, just a few) that have decided they will never iron again. No doubt they have a house full of modern machinery, and the domestic goddess can enjoy more of the house-hold entertainment. Now, don't get me talking about that!!!! Haha. Great Post Di. Not much has changed for many people - the irons may be more modern.